This person is listed on the Young County Service Roster Page in the original mid-1940's publication, "Men and Women In The Armed Forces From Young County Texas". Additional information about this veteran was submitted by his family and we thank them for this contribution. Colonel Jerry Bishop, USAF Retired, entered the US Army Air Corps in September 1942 as an Aviation Cadet in reserve status waiting for an opening to enter pilot training. That call came in March 1943 with graduation in January 1944. B25 transition training and A-20 combat crew training were next with follow-on assignment to the 416th Bomb Group, 9th Air Force at Melun, France, just south of Paris. He transitioned to the A-26 Invader at Melun and had lown 42 combat missions when the war in Europe ended. He was enroute to the US for a major modification replacing the canopy on the Invader with orders to proceed to the China, Burma, India Theater of Operations (CBI) when WWII ended. He was released from active duty to reserve status and returned home in September 1945. Colonel Bishop was recalled to active duty in 1951 for B-26 Night Intruder duty flying 52 combat missions and served as combat crew training officer and night combat operations officer. After returning from Korea, he served in a number of support flying functions and in Avionics and Electronic Warthre maintenance business. He also served as Electronics Staff Officer at HQ Strategic Air Command and HQ USAF. Recalled to aircrew duty flying the C-141 Sarlifler in support of the Vietnam War, Jerry was assigned to Dover AFB Delaware. After a brief tour of duty in the C-141 he was transferred to the C-7A conversion program which transferred the C-7 Caribou from the Army to the Air Force. He flew 810 sorties in South Vietnam in direct support of the 5th Special Forces Green Berets and the 3rd Marine Amphibious Force. 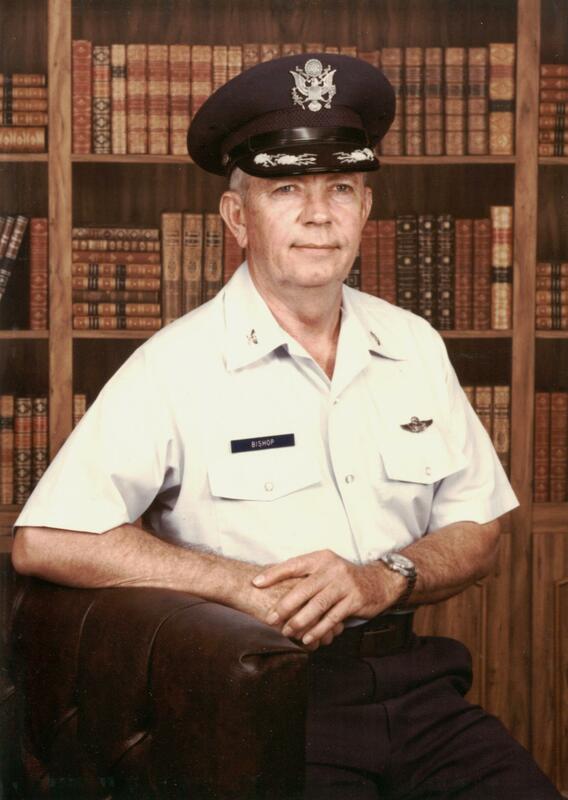 On return from Vietnam, Colonel Bishop continued in the Mainenance Engineering and Acquisition Logistics career field as Director of material management at the San Antonio Air Logistics Center, Kelly AFB, Texas and at HQ Air Force Logistics Command until his retirement from the Air Force in July 1977. Following retirement he worked for Lockheed Aircraft in Tehran, Iran under a U. S. Government contract to develop a wholesale logistics depot supply and maintenance system for the Imperial Iranian Air Force until all Americans were forced to leave Iran when the Shah abdicated power in the uprising of 1979. Jerry returned home to Graham, Texas and worked in the family oil business until his second retirement in December of 1998.